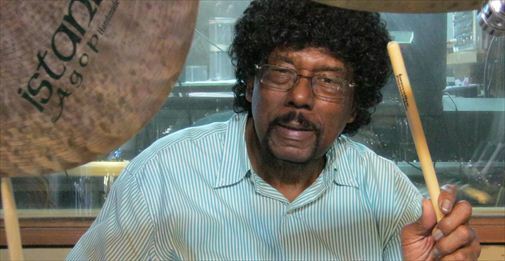 James Gadson is one of the most recorded drummers in the history of R&B music. Working with everyone from Marvin Gaye to Norah Jones, Aretha Franklin to Justin Timberlake, Gadson's prolific career easily spans 6 decades. In the 1960's, the funky soul group, Dyke & the Blazers, featured James on "Let A Woman Be A Woman", which later was sampled by the Bomb Squad for Public Enemy's "Welcome To The Terrordome". James Gadson's performances on Bill Withers' album Still Bill, featuring hits like "Use Me" and "Lean on Me", and also on Withers' Live At Carnegie Hall, remain some of R&B's most revered drum tracks. The great Jeff Porcaro, when asked about his well-known right-hand technique, quoted simply - "Gadson". James has played on over 500 gold records and hundreds of Motown sessions. Recently, live Beck shows featured James double-drumming with Beck's Indie drumming champion Joey Waronker. Incidentally, both Gadson and Waronker can be heard on Paul McCartney's latest album Chaos and Creation in the Back Yard. James Gadson is currently busy in LA, recording his upcoming solo record. IP is proud to welcome this drumming legend to our artist family!